Friends of Holy Cross weigh in! 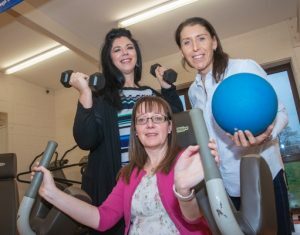 The Friends of Holy Cross are certainly pulling their weight – they have raised money which has been used for new gym equipment at the school. The group of parents and guardians was formed almost two years ago to help to raise money for extra equipment for the school. Last year, their funds went towards two new school minibuses and this year they have raised £1,350 which has been used to buy equipment in the school’s gym. Roseanne Rooney, who has two children at Holy Cross, said: “We raised most of the money through a fashion show we held at the school as well as raffles and our 100 Club. The Friends of Holy Cross will be providing mince pies and beverages at the Christmas Carol Concert at the school on December 18th(6.30pm start).